aradanito | a little blueberry's BIG adventures abroad. a little blueberry's BIG adventures abroad. Probably the scariest (and most painful) parts of preparing for your trip to Spain is getting your Visa. For my program, the Auxiliares de Conversación, I had to get a long-term student visa. When I was researching the process, I heard horror stories from all over describing how terrible the process was, but if you come prepared and follow the steps, the process isn’t too bad. The first thing you need to do is locate the Spanish consulate under whose jurisdiction you fall. For me, my consulate was in Houston, Texas. Check this list of consulates to find which consulate you will be working with. Visit your consulate’s website to view the requirements for your visa. Each consulate may have different requirements, so make sure you check with yours specifically. In addition, appointment options may vary. For the Houston Consulate, I could not make an appointment and I had to apply in-person (very inconvenient), so having all of my documents together was absolutely essential. A second plane ride to Texas because I forgot something was not high on my to-do list. If you can make an appointment, do so with as much time in advance as possible; if you can’t, get there early. Apparently some consulates allow you to mail all of your documents and then receive your visa a few weeks later by mail. While awesome, some consulates don’t have this option so, again, research YOUR consulate. Phew. Make sure you check with your consulate as to any other documents that you may need. These were the only documents that I needed to get my visa from the consulate in Houston, but others may require more. 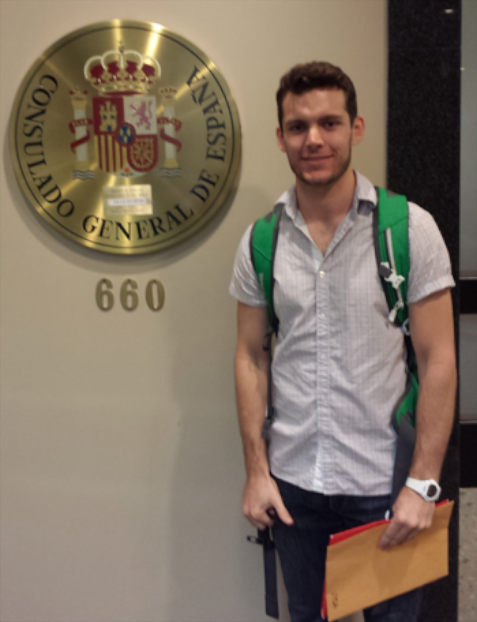 At the Spanish Consulate in Houston. Note the ubiquitous Visa folder clutched tightly in my hand. Passport: find your original, unexpired passport, blow the thick layer of dust off of the cover, and place in your handy-dandy visa folder. Drivers License: Open wallet/purse, ensure that up-to-date drivers license is enclosed, then close and pat reassuringly. Passport photos: the most common option is to head down to the post office and get a few photos, but the guy working there glanced around, leaned in and whispered to me that Costco and Sam’s can do it cheaper. I got 6 photos at Costco for a third of the price the post office charged for two pictures. If you’re not a member, no problem, but just a tip. Once you have your pictures (at least 3) obsequiously deposit them in your visa folder. Original Letter from the School or Autonomous Community (Carta de Nombramiento): At some point after being accepted into the program, you will receive an email with a few attachments, one of which is the carta de nombramiento. This is the letter containing information about your grant, the duration of your stay in Spain, the school where you will be placed with name, address, and phone number and about the insurance policy. I simply printed a few copies of this letter and placed them in my visa folder. I believe another copy will come in the mail, but I had not received mine when I decided to get my visa and my printed copies worked fine. Once printed, calmly place in your visa folder. In addition, the letter must be signed and dated by a certified MD or DO. The official requirements say that it must be apostilled, but I did not even get mine notarized and they accepted it without hesitation. I would get it apostilled just to be safe. Once done, slide into your visa folder. Original State Police Background Check: I had to head down to my local sheriff’s and get my fingerprints done. The fact that I was now on the grid and therefore traceable was tempered somewhat by my impending journey. Check with your local policed department to see the associated fee with the background check and submit any needed forms. I only had to wait two days before I received my notarized background check. Once you have your notarized background check in hand, you must either mail it or take it in person to the State Department in your state’s capital city. Ask them to apostille the document ($5 per document), then take it home and tuck it safely into its home, your visa folder. National Visa Application Form: You can find the Spanish visa application form here. I filled out three copies just to be safe. I ended up only having to turn in two, but the piece of mind was priceless. Once you have your visa application forms (3) filled out, slyly slip them into your visa folder. Money Order: Head down to your local bank and ask them for a money order to the amount of $160.00 made payable to the Consulado General de España. Just in case you’re unfamiliar with a money order, you pay the amount listed and they give you a slip of paper like a receipt that is guaranteed money, unlike a personal check. Take a few wrong turns on the way home just to make sure no one is following you, then cram your money order into your stuffed visa folder and hold a five minute celebratory freak dance session, because YOU DUN. If you can mail all of your documents in, good for you but we hate you. If you aren’t so lucky, arrange transportation to your consulate and, please, make sure you bring your visa folder. I flew out to Houston, took a rental to the consulate and walked into this huge, gleaming building. As I strode confidently through the lobby, I overheard a young man talking on his phone about how his application had been denied due to his Background Check not being apostilled. Do not find yourself in this position. If you’ve done your research your hard work will pay off and you won’t have a problem. I strolled into the office, waited a few minutes in line, gave away my now beloved visa folder (separation anxiety may set in, but be strong), and had my visa mailed to me. Hopefully it’ll be here in a few weeks! I hope that this makes the process a little easier for you. Good luck! !